Over the past decade, wireless technology has made huge strides in security, reliability and throughput. The wireless networks of today are almost as fast and reliable as wired networks and provide much more convenience and flexibility. As a result, there has been explosive growth in wireless networks of all types, from Personal Area Networks (PANs) to Wide Area Networks (WANs). 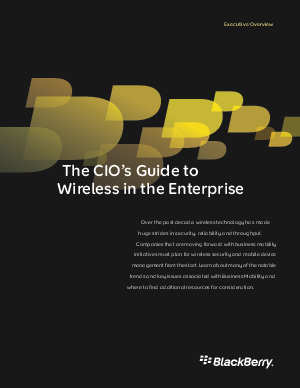 This incredible growth and renewed consumer confidence has ushered in the era of Pervasive Wireless - the availability of reliable, high-speed wireless connectivity nearly wherever and whenever a user requires it. In return, pervasive wireless, together with more powerful mobile devices, has enabled a dramatic shift in employee work habits. More workers are spending more time away from their desks and on the road, and wherever they are and whatever the time of day, they require the tools they need to do their job.